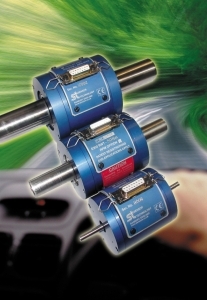 A dynamometer for testing 180 motors per hour for vehicle electrohydraulic power assisted steering, uses a non-contact torque transducer from Sensor Technology of Banbury for ensuring complete accuracy of the readings. Installed in a Tier 1 supply company, the dynamometer forms part of a highly automated test cell. A TorqSense transducer is used to regularly test the torque inherent in system. The test instruments are then calibrated to account for the measured ‘offset’. The transducer is a 1Nm RWT310 Series TorqSense, an intelligent unit with all the necessary signal processing electronics built into its main body, giving it a plug-and-go capability. In effect a TorqSense transducer is a frequency dependent strain gauge operating at ultrasound frequencies and consists of a piezoelectric comb mounted on the test shaft to monitor variations in its resonance frequency as the torsional load varies. An RF (radio frequency) link is used to an adjacent pick up. Records are kept on the production floor, which show the offset to be constant. However the quality standards and traceability now required by the automotive majors, make the TorqSense a vital operating part of the cell, as it removes any suggestion that the calibration is awry.